Hello lovely readers. So in September I'm redecorating my room and there are lot of things I want to get, I mean A LOT. So I'm going to share some of those things with you today. 1.First up is this hanging light bulb. I just think it's so cool and I love that you can hang it or just have it standing on a shelf or desk. 2.Next, is this rug from H&M, my carpet is a disgrace but I don't have enough to get a new one so this rug will help cover it up. Plus it's pretty. 3.If you read my favourite foreign films pots you'll know how much I love the film Amélie. I adore this Amélie print, it's so cute and I love the style. I'm planning to have loads of prints and art hanging up and this one will be perfect. 4.OK you know much I love cats, as in obsessed with them. So this photo frame is perfect for me, it's so cute! 5.Yes I want this candle because of the packaging but look at just how awesome it is. 6.I love how bright and pretty this bed set is. Nothing beats clean, new sheets! So these are a some of the things I would love to decorate my room with. Once I decorate my room I'll do a room tour. Do you like any of these? 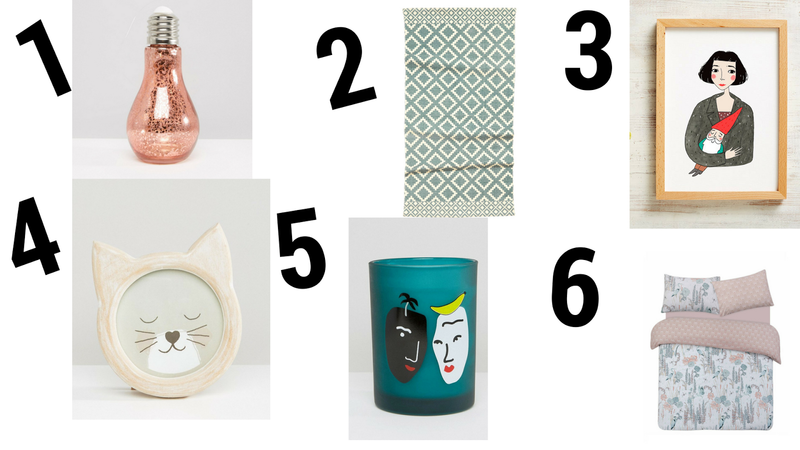 What homeware are you after at the moment? I love the bedding and the light bulb! They are so cute! I know right! I love them. Thanks for stopping by! It's from etsy, there's a link under the picture which will take you to it :) Thanks for stopping by! I know right? They are so pretty. Oo good luck with the move, hope it all goes well! Thanks for popping in! I'm so glad you like it, it's so pretty! Thanks for dropping by! I love that hanging light bulb! That rose gold color is gorgeous. That candle is also amazing. The packaging is everything! It's so pretty isn't it. Haha I agree I'm a sucker for cute packaging. Thanks for stopping by! I know right? Isn't it gorgeous?! Thank you lovely! I hope you have an awesome weekend! I'm so pleased you liked them! Thanks for popping in! It's so gorgeous isn't it? Thanks for dropping by! Thank you I'm, glad you liked them, thanks for stopping by! Sure, I'll give you a follow! Oh no that's a shame that they break easily! But I agree it's so pretty. Thanks for dropping in!